Provide comfort for the family of Lorenza Nunez with a meaningful gesture of sympathy. 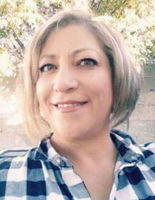 Lorenza C. Nunez, 51, of Las Cruces, NM died March 27, 2019. Lorenza was born January 26, 1968 to Natividad and Concepcion Nunez. Lorenzo was a passionate, loving, giving and humorous person. She touched many hearts, as she always went above and beyond to help others. She was a friend to many and a Hero. She will be remembered for her infectious smile. She is survived by her husband of 21 years, Adrian Nunez, two children Anthony and Jessica Granados, five grandchildren, Lenchito, Adriana, Makayla, Nate, and Gabriel. Also surviving her is her father; Natividad G. Nunez, four brothers; Guadalupe, Refugio, Natividad and Steve. Three sisters; Clara, Myrna, and Sonia and numerous aunts, uncles, nieces and nephews. Recitation of the Holy Rosary is scheduled for Monday April 8, 2019 at 10:30am with the Memorial Mass to follow at 11:00am at St. Genevieve’s Catholic Church with Deacon Lou Roman Officiating. To send flowers in memory of Lorenza C. Nunez, please visit our Heartfelt Sympathies Store. We encourage you to share your most beloved memories of Lorenza here, so that the family and other loved ones can always see it. You can upload cherished photographs, or share your favorite stories, and can even comment on those shared by others.